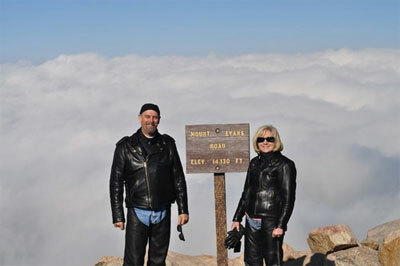 Jeff & Susan in their Fox Creek gear at Mount Evans. Susan and I do a lot of riding and like to be protected by our riding gear, thus the Classic II. I bought mine a year ago and Susan the Fitted Classic over the winter. On a long ride from White Bear Lake, MN to Vail, Colorado in June, we discovered how comfortable and stylish they are. On our ride we experienced heat into the 100’s, heavy cross winds, rain, and cold. We were surprised at how comfortable we were in the heat while riding with the vents opened (we did shed the jackets when it hit 100). They handled a couple of rain storms very well when we were unable to change into rain gear. When it came to the cold they did equally as well, providing plenty of room for layering and front closure to keep out the wind. I have not needed to learn how well they do when having contact with the road (I will take other testimonials as being true, thank you!). But I do joke with people that can’t get over the weight of the leather, telling them that… “if I go down they will be repairing the road.” It is comforting to know that gear of this high quality is available.